From the moment you arrive at Red Reflet Ranch, one is spellbound. Breathtaking views of beautiful cloud formations and vast open spaces engulf the landscape as you travel down a private driveway in search of a magnificent getaway. Though Millennium Magazine has visited many luxury family-friendly vacation spots, we had no idea what a delight was in store for us. Red Reflet (a French word meaning reflection) is a 27,000-acre all-inclusive luxury resort and working ranch far from civilization, in the quiet little town of Ten Sleep Wyoming. 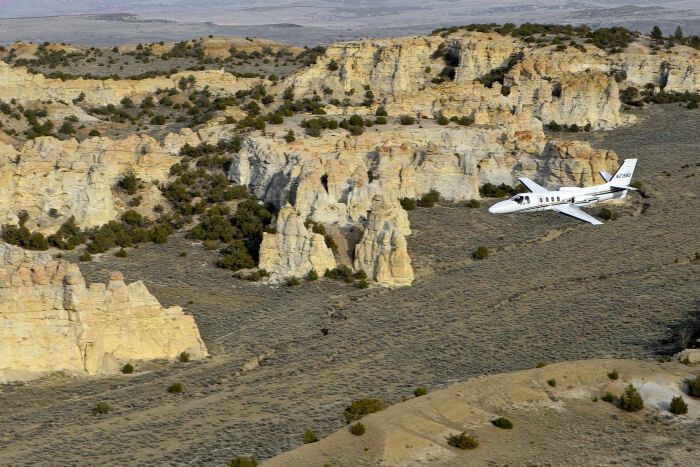 Located a two-hour drive from the closest airport in Cody Wyoming — the resort also boasts its own private 5,000 ft. airstrip where guests can be flown in and out of by ranch owners Bob and his wife Laurence Kaplan. Anyone with their own plane is welcome to use the runway with a pre-authorization and flying lessons are available for those with a sense of Aeronautic adventure. Upon our arrival, we were greeted by the resort’s private Chef, Clint Loftin who welcomed us into the Main House and literally gave us the cook’s tour. This charming home, where Bob and Laurence reside, is filled with lovely decorations and artifacts collected from their travels around the globe along with fossils from prehistoric dinosaurs and sea life found in the area. There is also a souvenir shop with unique items available for purchase. The most notable are the Gurgle pots; French pitchers shaped like fish that gurgle when liquid is poured from their spouts. The house showcases panoramic views in every direction with glass walls that slide completely out of sight in the main dining room. Thus inviting nature in or the guests to step out onto the a-joined deck to overlook the incredible views. At the right time of the evening, you can see the Reflet of the magnificent rocks in the ponds below. This is the desired spot for guests to enjoy the ranch’s daily family-style lunch alfresco, post activity libations and or their nightly cocktail hour followed by a 7 PM dinner. All the guests are welcome to join or they may cook in their own chalet. Adjacent to the main dining room is another, impressive and unique space made of glass on 3 sides and ceiling that mainly functions as a lounge and greenhouse. This room offers different yet no less stunning views and is a great spot to dine especially if the weather is not so agreeable. We were then escorted to our Ponds Chalet, which sat near the banks of the multiple artesian well-water ponds (located just a short drive from the main house). 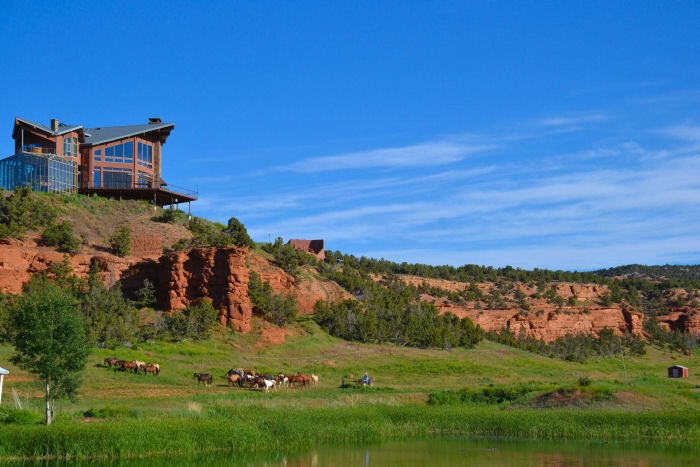 The Chalets overlook the picturesque ‘Chugwater’ rock cliffs and an open pasture where their horses frolic every evening. Strategically placed for families with children, the cottage is a stone’s throw from the kid-friendly natural water park and other fun activities the ranch has to offer, including zip lining, trampolining, horseback riding, chicken ranching and gardening. The chalet is a fully furnished luxury 3 bedroom house with a multitude of amenities that includes a fireplace, outdoor Jacuzzi and dining area with a grill, a television and games. If there is something not provided you desire, they will do everything possible to accommodate your request. For instance, if one desires sourdough bread for breakfast, Chef Clint has been known to accommodate with a freshly baked loaf made with his 150-year-old family sourdough bread starter. The refrigerator and pantry are stocked with a variety of farm fresh wholesome breakfast foods from toast and coffee, to pancakes, bacon, and eggs (picked daily from their chicken coop or guests are welcome to collect some eggs on their own) to the possibilities of Eggs Benedict. Laurence arrived at our chalet to give us a warm welcome and let us know that orientations for horseback riding and ATV driving were scheduled for safety reasons and to give the ranch-hands an opportunity to see the guests level of skill for proper guidance. When the instructions were over, each person was assigned a horse and handed the keys to their own ATV (kids included) or Razor (if you prefer; an all-terrain vehicle more like a car), to explore the mass acreage at your leisure. The ATVs are mostly used for transportation on the ranch as they are easier to maneuver and much more fun than a car. Days are easily filled and go by quickly because of the many activities. Each is so thrilling it’s hard to break away from one and go on to the next. No matter what level of experience you are, Bob and Laurence and their patient staff will help teach you what you need to feel confident about any activity you wish to participate in. Even if one is afraid of heights they have the amazing ability to reassure a wary zip-liner by explaining how it works and that all will be well — giving guests the comfort to overcome their fear and put a big smile on their face. Akin to Never Never Land it is not long before you realize this place is designed for not only kids but the kid at heart. With its many activities to select from, Bob and Laurence suggest to pace yourself while creating your personal daily itinerary, which is usually confirmed during dinner the night before. Starting the following day with a morning horseback ride, we headed out into the caverns of the red rock cliffs. Getting a nature lesson from ranch pastry chef and expert horse wrangler, Stephanie Shaw, who makes the ride as educational as it is spectacular. Her tour includes wildlife sightings while sharing the area’s history. It is easy to feel like you are watching an old western movie but reality hits when the vivid colors and scenery wake your senses, reminding you without a doubt, you are really there. Riding through the rocks, trees and open fields help one relax and peel off another layer of stress — leaving you feeling relaxed and refreshed, creating positive memories that will last a lifetime. After an exquisite lunch of gourmet ranch raised beef burgers with homemade brioche buns and freshly picked lettuces on the beautiful back deck, we joined Laurence and a family from Australia on a hike in the Castle Gardens — sitting on top of a small mountain formation hundreds of feet in the air. As we climbed up, on and around a huge rock playground filled with chairs, slides, people, animals (to ride) all made of natural stone, there was even a formation that seemed like a castle turret that we climbed to overlook an imaginary kingdom. Wildlife sightings were abundant as we saw an owl nesting, rabbits, hawks, lizards, and more. This hike is a challenging workout as well as a meditation for all of your senses — truly a magnificent experience. After the daily activities, you are encouraged to hit the water park for a swim before dinner. This natural spring pond includes a slide, zip line (stopping in the middle of the pond), a rope swing and a small bridge that takes you to a tiny island. Kayaks and floats with life jackets are provided to enjoy the turquoise blue, crystal clear and refreshing Artesian water — touted to have many healing properties that will revitalize you every time you indulge. During cocktail hour the ranch serves delicious and creative appetizers such as fresh goat cheese crostini with blackberries and microgreens. It is also a great time to get to know the hosts and other guests along with more of the ranch’s history. 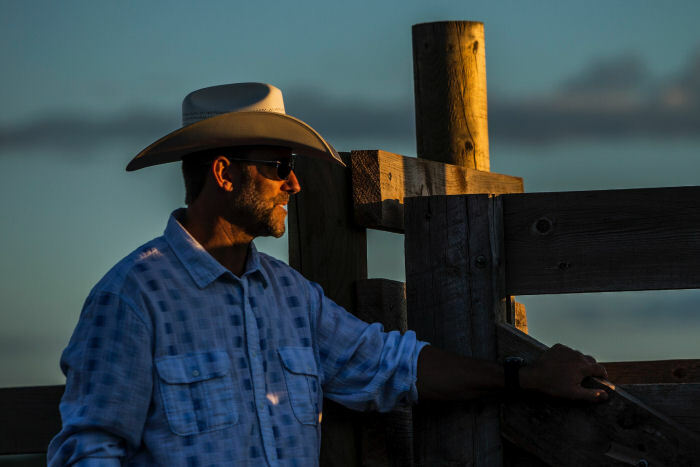 One evening Laurence shared that writer Craig Johnson of the popular A&E television series, ‘Longmire’ and some of the cast (that included Robert Taylor, Lou Diamond Phillips, and the heartthrob Bailey Chase) were guests of the ranch while shooting in various locations nearby. Ten Sleep WY had made it into the show and Red Reflet hosted a special dinner with Johnson to meet, greet, dine then watch 2 of the latest episodes of ‘Longmire’. Dinner is a unique and unforgettable experience. All the guests are served family style at one or two beautifully set tables (adorned with Gurgle pots) in the main dining room while taking in the magnificent view. Gracious host and hostess Bob and Laurence are present to regale you with stories of guests and adventures past, answer your questions and intrigue you with the possibilities of your next ranch experience. If gastronomy is a passion you will not be disappointed, the chef is available to teach you some of his amazing recipes. Everything served is presented and explained by Chef Clint before the meal begins and is either grown or raised hunted or fished on the property. It is then exquisitely prepared in gourmet style looking like artwork and tasting as though you were in a 5-star restaurant while being served by their French wait-staff. Our first night’s dinner was beef raised on the ranch, organic salad and vegetables from the garden, freshly baked bread and superb wines from Bob and Laurence’s private collection. Lunch and dinner are always topped off with a dessert presentation of freshly prepared gourmet treats, made that day by their top/notch in-house aforementioned pastry chef. Each night after dinner, guests return back to their cabins with a delicious box of homemade pastries for breakfast. The first evening in your chalet would not be complete without getting into the private hot tub set on the outdoor deck where one can see every star in the universe. This will help you peel off one last layer of stress as you end the night stargazing. Each day at the ranch held another amazing adventure. Participating in a cattle drive is a once in a lifetime experience. Heading to the firing range is a freeing experience for those who like to shoot guns, far away from everyone, so there is little danger. Target practice and gun safety is a must with the ranch’s rifle expert Latner who is very patient especially with anyone who has never handled a firearm before. The four station zip-line course is as thrilling as anything one could hope for, especially watching Laurence, who at an age when most slow down, was hanging upside down while traveling the course. Fossil hunting for Belemnite fossils among the hills of bentonite clay could take one back to their prehistoric ocean science lessons. Their deep woods trail ride on horses might have you thinking about the peace and freedom that must have been felt by the settlers hundreds of years ago. The freedom to ride a mountain bike or an ATV anywhere at any time is one of the activities especially exciting and liberating for kids. 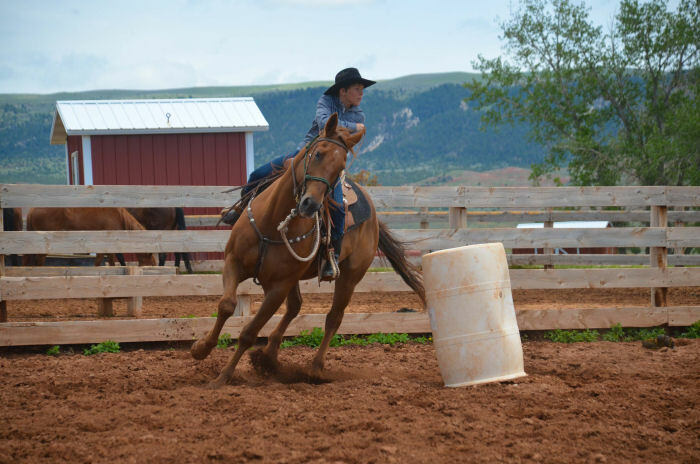 The encouragement from the staff on this ranch during any given activity while fostering a feeling of safety is very comforting to parents if they choose to allow their children free reign. If you are searching for a wildlife experience, Bob is your man. He can either accompany you on a live excursion to a few waterholes many miles outside the main resort to observe live animals or view the photographs from his motion-activated cameras set up in trees around the same location. Owners Bob and Laurence Kaplan have brought a sense of European hospitality to Ten Sleep. Creating not only a resort to engage all your senses but a place of harmony and peace breaking down the layers of stress that come with living the overworked American lifestyle. A place the pair calls home and where so many guests feel at home. We left feeling like we were family with this wonderful couple that has opened their home to create and share this magical place. Learning that not only do luxury vacationers, celebrities, diplomats, top military, government officials, as well as big business owners find their way to this special place but they continue to come back. For those who love nature and the finer things in life without all the formalities, this is the place to be. There is an intended healing that happens when you visit Red Reflet and a fellowship with the people you meet. A trip to this ranch is one that will create amazing, special and cherished memories like no other and in no way can words or pictures adequately describe an experience here. And when you fall in love with this magical place, there are homestead ownership opportunities available for those looking to make a more permanent commitment.